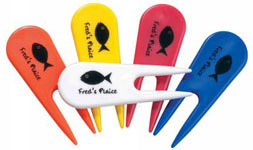 Plastic pitchfork available in a variety of colours printed to your artwork. Price includes a one colour print. Multicolour options are available at extra cost. Product size - 65mm x 20mm. Supplied with a detachable metal ball marker with decal insert. Price includes a one colour print. Multicolour options are available at extra cost. Origination, VAT and carriage are extra. Print size - 20mm diameter. Brass plated pitchfork with a serrated edge. Decal can be printed up to four colour process. Print size - 14mm diameter. Product size - 70mm x 28mm. Brass plated pitchfork with laurel wreath motif. Decal can be printed up to four colour process. Antique bronze finish pitchfork. Decal can be printed up to four colour process. Product size - 70mm x 30mm. Pitchfork with brushed satin and polished chrome finish, detachable pitchfork and printed magnetic ball marker to your artwork. Product size - 110mm x 30mm.